모든 제품이 고급스러운 케이스에 담겨집니다. 따로 포장을 하시지 않으셔도 받으신 상태 그대로 선물하실 수 있습니다. 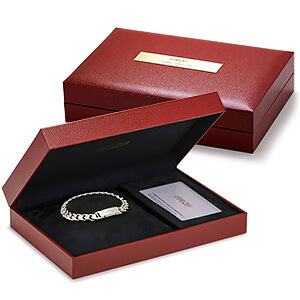 All products are packed in a luxurious case. You can gift you received as a separate state aneusyeodo not you packing. 다이아몬드 반지를 포함한 낱개의 반지는 고급스러운 가죽케이스에 포장됩니다. 반지를 가장 돋보이게 해주는 검은 색상의 가죽케이스는 바로 선물하셔도 될 정도로 고급스럽습니다. 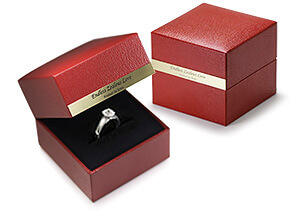 Are packed in a luxurious leather case containing a diamond ring is the ring of individually. 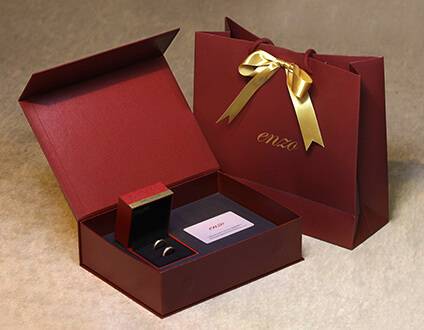 The luxurious leather case just enough to be acceptable gift of black color that best complements the ring. 목걸이와 팔찌는 세련되고 고급스러운 가죽케이스에 담깁니다. 각각의 제품에 따라 긴 형태의 가죽케이스나 정사각형의 케이스에 정성껏 포장됩니다. 세련되고 모던한 가죽케이스는 제품의 격을 높여줍니다. Long wall in the chic and luxury leather cases necklace and bracelet. Are carefully packed in the case of the long form of a square casing or leather according to each product. 배송되는 모든 제품도 쇼핑백에 정성껏 담깁니다. 제품케이스 + 워런티 카드 + 보증서와 감정서 + 쇼핑백 입니다. Carefully bags long wall on all products shipped. Product Warranty and various shopping bags + Case + certificate.